This century's innovations in colour saturation have bleached out the 1990s. But in its time it was a decade that flooded our lives with brightness. It included the last years in which anyone in the subcontinent would use the word "multicolour" as an optional description of sensory experience. In 1996, when the Indian subcontinent hosted the cricket World Cup, even the kits of the home teams, coloured for only the second time, seemed to reflect this. Pakistan gave up their Cup-winning pistachio, the most magnificent shade a sports team has ever worn, for a deep, jewel-toned green. India borrowed England's beautiful, summer-sky blue, to be associated forever after with Ajay Jadeja. And in Sri Lanka, some prophet heralding the results exchanged that team's bright but weightless cobalt for a rich royal blue. Those who still remember the quality of the cricket played during that tournament may do so because they are, even now, in love with the game. In my case, the bolt of overstimulation has left me with only a few deep impressions. The results; the faces of those to whom they happened; the blaze of old newspaper in Eden Gardens during the India-Sri Lanka semi-final, as the home fans ended up creating the next day's headlines. What stuck in my mind was different, if not entirely separate, from the game. Although I had never been more interested by cricket - and it quite took over my life for the next few years - it was the advertising that swamped my occipital lobe. 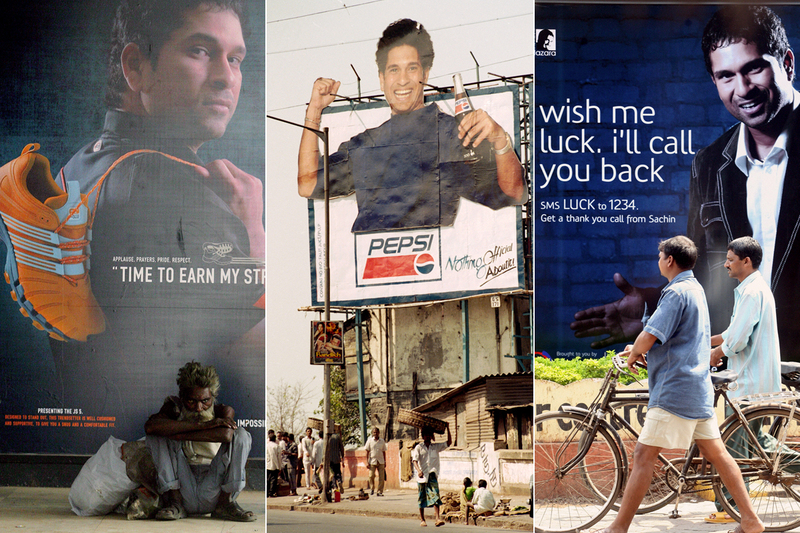 Much of the colour on-field was anticipated, if not outright surpassed, by the tournament's ad campaigns. Zadie Smith once called the music video "the art form in which my not-quite generation truly excels". Liberalisation's children did not invent the cricket commercial, but the cricket commercial may have invented the child, or at least the part of him - it's usually a him - that is a cricket fan. Survivors of the 1990s in India are familiar with stories of the rising economic tide that lifted many boats. Among its beneficiaries were things that went on to become fundamental to Indian cricket fandom: cable TV, fast-moving consumer goods, and the career of Sachin Tendulkar. All of these contributed to the blossoming of the cricket commercial, as art form and vehicle of popular emotion. Advertising's first ambitious cricket campaigns began by trying to reimagine cricketers, and to some degree cricket itself. The success of these ventures has resulted in campaigns that now attempt to reinvent the cricket fan himself, muscling in to govern the emotional territory in which our love of sport and team dwell. I'm not sure where the language and aesthetic of these ads come from, but I wonder if my not-quite generation is ceding their own in the making, and watching, of these ads. I am describing, for the moment, campaigns that are mostly designed around the sport and its big tournaments. This form attained a kind of hysterical high earlier this year, with the overwhelming success of the "Mauka Mauka" campaign, made by Star Sports for Indian viewers (and beamed to other countries). The nameless protagonist of the commercials is a Pakistani man who spends 20 years, and five World Cups, hoarding a box of fireworks he hopes to light when Pakistan beats India. The disappointment accumulates on his drooping shoulders and greying hair as Pakistan are beaten at every World Cup by India. I was in an oversensitive Indian minority that refused to like it. I may not have been alone, but it is so difficult to tell: trade publications reported that the campaign's first and best-known ad was watched 2.3 million times on YouTube in three weeks. The ad's sophisticated visual logic wove the Coca-Cola red in and out of India's everyday landscapes. What could be more Indian than Coca-Cola? That isn't quite as much as your average Lady Gaga video. But it's not bad for an ad targeting a tournament played by 14 countries, the largest of which doesn't even have a truly reliable 3G data network in its metros. Eventually 288 million people tuned in to the India-Pakistan match, both sides caught in the undertow of the narrative. It was infuriating to see Pakistan lose; I personally blamed them for prolonging the air of smugness inaugurated by the ad campaign. 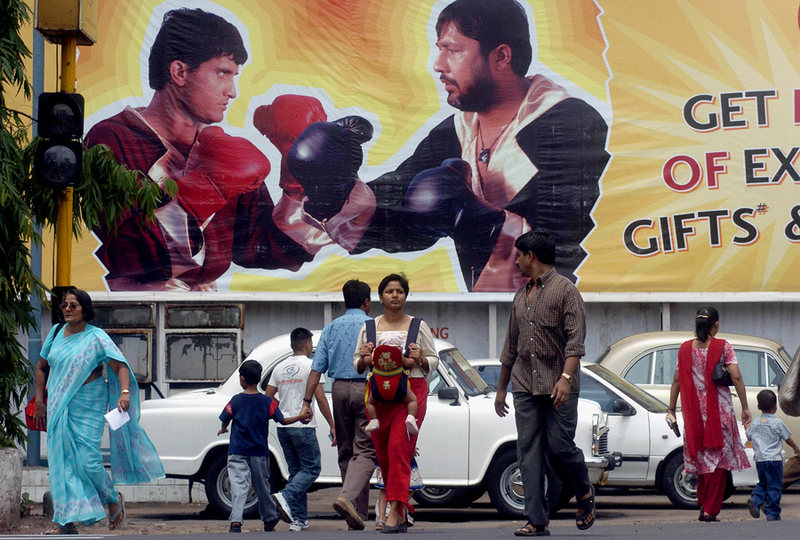 The only consolation was the wit and vigour with which other South Asian fans lobbed back the joke, with fan-made trailers and ad spots set to the campaign's catchy theme tune. 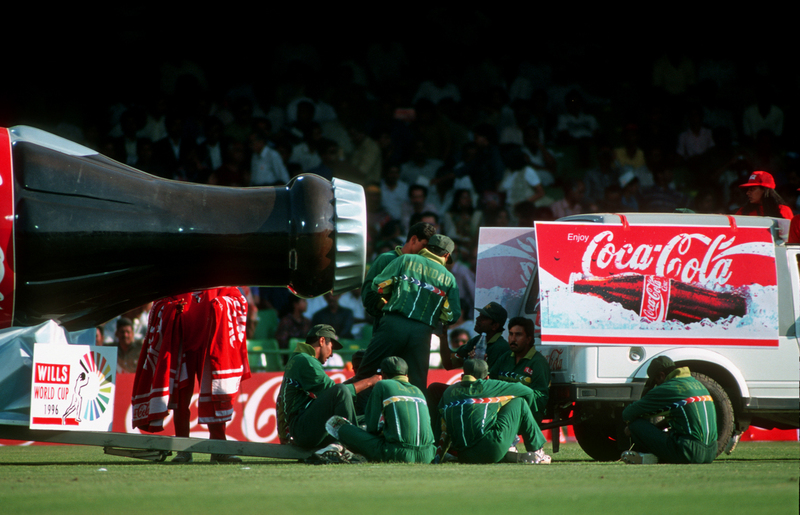 The first real match of the 1996 World Cup was played in India between Pepsi and Coca-Cola. The Pepsi campaign on TV was flagged off by an extraordinary voiceover over a dark screen. "Officially, cricket is played in whites," a gentlemanly voice intoned in Received Pronunciation, "at a leisurely pace." The screen lit up with vistas of screaming desi hordes, behaving, presumably, the way no one ever had at Lord's. Groups of Asian and Caribbean cricketers, dressed in multicolour, literally acted up on field. "The official players are gentlemen," the voiceover said, over the sight gag of an angel-faced Vinod Kambli drawing a finger across his throat, grimacing. The sell came in the last clause: gentlemen "... have to drink the official drink", as Courtney Walsh and Ian Bishop made a face at a generic red and white glass, presumably filled with inferior cola. Instead, they drank Pepsi (A-ha! ): there was nothing official about it. "Nothing official about it" became a famous tag line, partly because it was an aggressive response to Coca-Cola. Coke had only recently re-entered the Indian market, having left the country in 1977 because of restrictive government policies. Trying to emigrate into local consciousness once again, Coke won advertising rights to call itself the World Cup's "official drink"; it was a strange, foreign concept. In retrospect, you only have to look at the commercial they put out to see what a long way they were coming from. The ad was a dream of India. In a visual trope that would subsequently become very familiar, the whole country became a gully for small boys. They played cricket in the foreground of forts, unfurling dupattas, and the Taj Mahal. Nusrat Fateh Ali Khan's "Mustt Mustt"- a slight, world-pleasing number, recorded in the UK - wafted over the scene. The ad's sophisticated visual logic wove the Coca-Cola red in and out of India's everyday landscapes. What could be more Indian than this crimson, it seemed to ask; what could be more Indian than Coca-Cola? Pepsi took this quest for legitimacy, opened it up and refashioned it, so that the question you were left asking was: what could be more Indian than cricket? Leave the official narrative to the gentlemen in white, it said. Gentlemen in colour - and of colour - played razor to throat, like Kambli; they danced and whooped and shook their fists on the world stage. Some people may have found this sleight-of-hand strange; associating colour and race in this manner conformed more to stereotype than to reality. In its follow-up spots, Pepsi had Bishop play calypso drums; Walsh drove a bulldozer to the nearest cola stand, wreaking havoc, it was understood, in much the way he did on the pitch. It is difficult to feel awe at the spectacle produced 20 years ago in a tournament where ad spending reportedly amounted to Rs 900 million; the 2011 World Cup exhausted something in the region of Rs 15 billion. Yet the power of suggestion deployed in those early ads allowed its ideas to bury themselves deep within our consciousness, and perhaps even within cricketers. By the time Sourav Ganguly whipped his jersey off at Lord's in 2002, we could hardly be surprised that the soap opera now regularly featured lather. This year's "Mauka Mauka" campaign and its success make two things clearer than ever before. One is the degree to which our response to cricket is learned, or enhanced, by advertising. In an interview with the Indian Express, the director of the commercial, Suresh Triveni, said: "What has clicked with the audience is that its content keeps changing and springs a surprise each time." This was not only cacophonic, the way sentences comprising buzzwords tend to be, but patently untrue. What actually "clicked with the audience" was plain schadenfreude, no different from the welter of malevolent joy that you - a general you, but also I, certainly - feel when Shahid Afridi throws away his wicket. This strikes me as not unrelated to the second innovation of the modern cricket ad: its participatory nature. Many of the responses from Pakistan and Bangladesh were spontaneous, which is clear proof of schadenfreude. The Bangladesh fans chanting mauka mauka at the losing Indians during their recent ODI series could be said to have reclaimed some authentic emotion from the commercial - which had long since accomplished its mission anyway. 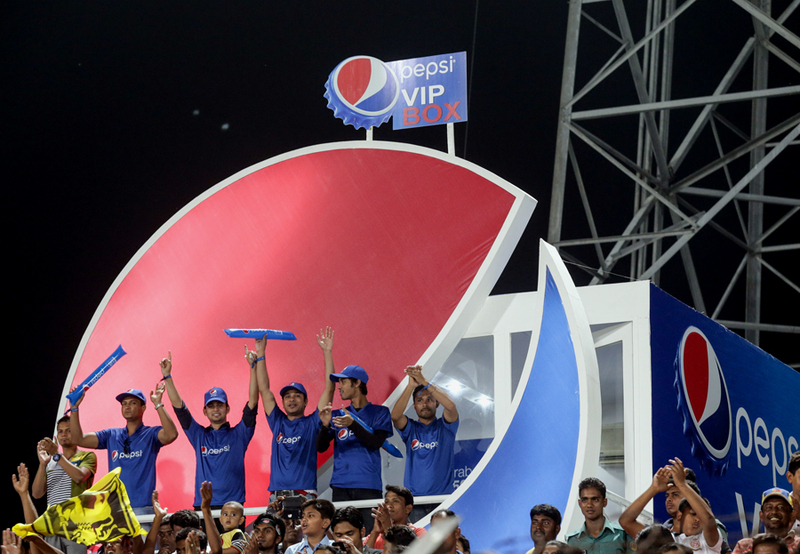 Then, not long after the end of the World Cup, Pepsi inaugurated a campaign called "Crash the Pepsi IPL". This solicited fan-made commercials featuring families and surroundings, which the company promised would air during the tournament. "Crash the IPL" demonstrates how much the world to which it must appeal has changed. The spot features the actor Ranbir Kapoor and Virat Kohli, both ideas whose time has come. They bracket the derring-do of an upbeat Indian family that excitedly puts together a performing act to create an ad that will make it to the IPL. Kapoor may be a movie star but this dancing, singing family will show him how cheerleading is really done. Kohli appears as the punchline. "Aur main kya karoon?" he runs up to ask the family - what do I do? "Beta, apni game pe dhyan de," the imperious grandmother tells him. "Yeh ad-shad na kiya kar." Son, focus on the game: don't do these ads. The relentless pragmatism of this commercial is very enjoyable. Gone is the humble dream of doing something that will get you into the stadium to cheer your team. Happily for most upper-class Indians, the IPL has made that relatively easy. Elsewhere in the subcontinent, sponsors run campaigns that give you a chance to show off your cricketing talents, maybe even play alongside your idols. But with this campaign, you could "crack" the IPL in a way that bypassed cricket altogether. Suspended was the traditional fantasy of getting on the field and powering your team to victory. So wholly integrated is the IPL with its advertising that appearing in a commercial in between overs is tantamount to being part of the tournament itself. Even the cute grandmother's punchline performs a demarcatory function - leave cricket to the cricketers. I am reminded of a 2011 story about Lalit Modi in the Caravan, in which Samanth Subramanian pithily characterised the IPL as a tide of money disguised as a tide of cricket, "guaranteed to wash over an Indian audience that is forever willing to diagnose itself as cricket-mad". Most cricket ads are aimed at the casual fan, to whip up fervour or to remind us to turn on the TV on a Sunday afternoon in February. Yet the real protagonist of cricket ads is usually the serious fan, who is something of an aspirational figure. The Pakistani protagonist of "Mauka Mauka" is not merely endearing because he is a bit of a schlimazel after all; his commitment is admirable, and everyone would like to believe it is an echo of their own. It's interesting how hard our popular culture tries to make this commitment out as not just noble but also somehow natural. In trying to reflect how dependent we are on cricket, I can't help but feel the aggressiveness with which ads promote fandom is meant to make us dependent on their language. It may be that this works for a lot of fans, but it just seems funny and a little pathetic to me. The ad agency that wrote the frankly ludicrous "We Won't Give It Back" campaign, also commissioned by Star Sports for this World Cup, announced that it "attempts to connect with the youth in their language". (I'm not sure why advertisers, so capable of writing deft, clever copy, fall back on balderdash in their own literature.) It was fundamentally silly; everyone has to give it back, unless they're Australia. 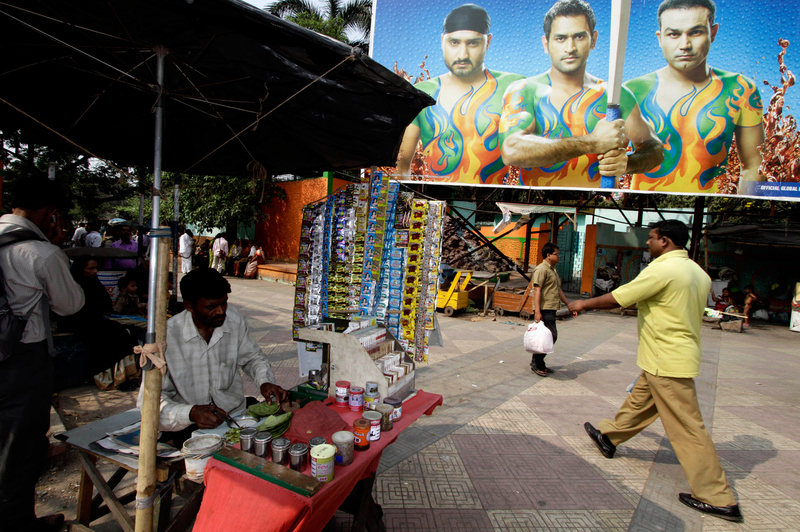 In its zero-degree tilt towards machismo, cricket advertising in India certainly borrows, as cricket programming itself does, from the metaphors of more hardscrabble sports such as football (which, at least in England, has turned to nostalgia for a more brutal past, even as its stadiums grow safer, more expensive, and less welcoming to the game's working-class supporters). This is fine: you can play along if you have to. Everything about a cricket commercial exists on the premise that you, the fan, love cricket so much that you will buy into everything that comes with it. But I wonder what happens when these attempts at making meaning speculate beyond their value. One day an ad trading on the live index of your fervour will inflate it the way desperate economies minted money in the 20th century. What will it be then, except for paper? You say you won't give it back now, but one day your love will be five billion Weimar Republic marks. Nike, one of global sport's omnipresent sponsors, joined in the generally sanguinary air of this World Cup with an Indian campaign called #BleedBlue (which is nice because it's the one thing Nike jerseys don't do). It also made a prestige spot, distinct from the campaign, perhaps as an option for those who wanted to forego all the aggro viral stuff, or perhaps for advertising award juries. "Make Every Yard Count" played on some familiar themes, which crop up now and again in newer ads: cricket can be played anywhere as long as it's in India; the lack of space makes things more interesting; playing cricket can transport us into a different reality, where our surroundings, which normally hold us back, rejoice in our freedom. The spot itself is an epileptic montage of young cricketers, all playing the same sequence of delivery-pull shot-run to the boundary. Nike claims it used 1440 different people, and "2,25,000 crowd sourced moments"- all of which look suspiciously well-staged and not at all crowdsourced - "to depict that one moment, where the cricket-crazy youth of India has just one goal, to make every yard count". The whole thing is as calculated as it sounds. The exceptional number of human faces it threw up on screen also threw into sharp relief something that does not seem relevant but is, in reality: there are no women to be seen anywhere. It may seem like being bothered by the lack of women in a commercial about Indian cricket is like being upset that the sky is blue. But it wasn't until I saw it that I realised that women aren't, in fact, entirely absent from this universe. Often, like the "Mauka Mauka" man's wife, they're long-suffering cricket widows. At best, they're silent and appreciative onlookers. But whether they're watching or just getting in the way, they do, in fact, exist. One such nameless character was even responsible for my becoming a feminist. One of the best-known advertising men in India, Piyush Pandey, producer of some of the country's biggest cricket campaigns, used to be a Ranji player. In 1993, he and Ogilvy & Mather produced an unforgettable commercial for Cadbury's Dairy Milk, which takes place in the genteel hush of a cricket stadium. A young man in whites, playing on 99, hooks a ball and the stadium holds its breath over whether it will carry over the boundary. When it does, the music swells and a beautiful young woman jumps onto the field, dancing for joy. The whole setting was so new that it was almost embarrassing. Commercials tried to present aspirational snapshots of life as it ought to be for upwardly mobile people. Twenty years ago, dancing for joy on a cricket field was not part of that vision. The ad helped create a world in which this was thinkable. It was the first major commercial, and perhaps the most successful one, to link consumer desire with cricket fan-love - and it centred around a woman. It would now be absurd for a commercial to be set on a cricket field and not involve dancing.The job of a commercial is to mimic that moment of sublime joy when something wonderful happens in the game, and you, watching from the stands or at home, feel like the whole world is a cricket field. The "Make Every Yard Count" campaign is a good example of this, and a link in a chain that Nike, in particular, has tried hard to forge. The ad tried to evoke the mood, and ideas, of the first real cricket commercial Nike made in India. It aired in 2007, over 15 years after liberalisation - a lot of lost time to make up for. It was also, embarrassingly, the year of India's worst World Cup performance in years. Yet the vein they tapped did not flush with disappointment, because Nike decided to forego the dancing batsmen and throat-cutting bowlers, and went back to the old idea of cricket as a miracle, a piece of eternity in everyday India. In a two-minute spot, the temperature slowly rises over a dense traffic junction ground to a halt. A cricketer in ordinary whites - a local lad - clambers up to the roof of the team bus to see what the hold-up is. His batsman friend climbs up after him; almost instinctively, they take position. The bowler bowls, the batsman smacks it into the balcony of a nearby house. Then, like a snoring giant opening an eye, the entire street stirs. At the end of the commercial, everyone and everything has come awake to participate in the next delivery; the very walls seem to dance with the joy of the game, pulled in by a terrific soundtrack (which riffs off a Konkani classic by the great Goan chanteuse Lorna). To understand its power, you have to see the film, half a minute in, when the young man into whose house the ball has crashed comes out on to his balcony, puts a foot to the railings and hurls himself down to the top of a truck to join in. It is both deeply sentimental and arrestingly beautiful, as if the open vein of cricket runs a very deep and human red. Who after Tendulkar and Dhoni?